Thousands chant “death to America” and “death to Israel” as they protest US decision to blacklist Revolutionary Guards. Thousands of Iranians in Tehran on Friday chanted “death to America” and “death to Israel” as they protested the US decision to designate the Islamic Revolutionary Guards (IRGC) as a foreign terrorist organization, i24NEWS reports. After Friday’s prayer ended at mosques in Tehran, thousands gathered at the Enqelab-e-Eslami (Islamic Revolution) square in the Iranian capital, burning Israeli and American flags. 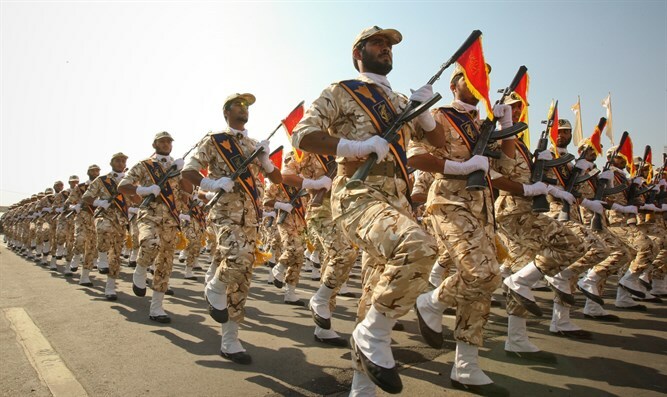 US President Donald Trump officially designated the Revolutionary Guards as a terrorist organization on Monday, calling the decision an "unprecedented" move which "recognizes the reality that Iran is not only a State Sponsor of Terrorism, but that the IRGC actively participates in, finances, and promotes terrorism as a tool of statecraft." The decision effectively means that anyone who deals with the Islamic Revolutionary Guard Corps could face prison in the United States. Shortly after the US announced its move, Iran countered by declaring the United States a "state sponsor of terrorism" and US forces in the region "terrorist groups". On Friday, Iranian Foreign Minister Mohammad Javad Zarif stressed that the Islamic Republic will hold the US accountable for provocations against the IRGC in a letter to the UN Security Council and Secretary-General Antonio Guterres. “The US and several puppet governments will bear responsibility for dangerous consequences of the adventurism,” Zarif said according to the IRNA news agency. “The provocative move will raise tensions to an uncontrollable level and increase threats in the region,” he added. Iranians regularly shout “death to America” and “death to Israel” at public rallies. Iran’s Supreme Leader, Ayatollah Ali Khamenei, recently claimed that the slogan “death to America”, is directed at Trump and US leaders, not the American nation. Khamenei said that the chants will continue as long as Washington continues its “hostile policies”. Iranian President Hassan Rouhani, often touted as a “moderate” president, has personally presided over “Death to America” chants during rallies in Iran, even though he claimed that Iranians “respect the American people”. Similarly Zarif, with whom the Obama administration negotiated the 2015 nuclear deal, was caught on camera last year joining in a public chant against the US, UK, and Israel.